I am back, again, for the third or fourth time. Mounting an Aimpoint H-2 on a Caspian carbon steel frame. As always, the best product on the market! Sehr schöne Montage und absolut stabil, nur leider sind die Bohrungen für die Köpfe der mitgelieferten Schrauben zu klein und mussten daher etwas aufgebohrt werden. Ansonsten ist die Montage klasse, da das Mikro H1 damit sehr dicht über den Schlitten kommt! Die Schrauben sollten unbedingt mit Loctite gesichert werden!! Please add to my review . . . . mounted on a Caspian 1911 Titanium frame. Outstanding . . . . just outstanding . . . . well designed and fabricated . . . . . I wouldn't expect anything less from Saul and crew. Many thanks guys! This is probly the best mount out there for the Aimpoint Micro. I have this mounted on a Tanfoglio Gold Custom. Fits just perfect. The fit is just the same for Tanfoglio as for the 1911 as the pictures show. Designed according to Saul Kirsch’s specifications, the DAA Aimpoint Micro Sight Mount will place your Aimpoint Micro Sight much lower down to the slide and get that large battery cap out of your way by rotating the sight 90 degrees to the left. It thereby places the battery compartment on top rather than off to the right. 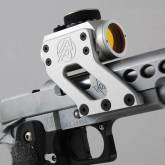 The mount attaches directly to the body of the sight without the use of the originally supplied dovetail mount, thus reducing bulk and obstruction of view.